Naples, Fla.(May 25, 2018) - According to the April 2018 Market Report released by the Naples Area Board of REALTORS® (NABOR®), which tracks home listings and sales within Collier County (excluding Marco Island), Collier County enjoys a 7.76 month supply of inventory compared to a 4-month supply nationally. This means inventory growth has been strong across all price ranges and summer buyers should be pleased to have lots of choices when shopping for local real estate. According to Cindy Carroll, SRA, with the real estate appraisal and consultancy firm Carroll & Carroll, Inc., the rate of inventory loss is declining, and she predicts the Collier housing market will become even more stable before the end of the year. Carroll considers a 12-month supply of inventory a stable market for Collier County. Nationally, a stable market is reflected as having a 6-month supply of inventory. Even though April's inventory fell 2 percent to 5,793 from 5,920 in April 2017, it's rebuilding from an annual low of 4,608 properties in inventory at the end of September 2017. Geographically, real estate activity was strong across the entire county, but closed sales of single-family homes in South Naples were most remarkable with a 51 percent increase to 62 closed sales in April 2018 from 41 in April 2017. In North Naples, although inventory was down 8%, the year over year pending sales increased 9%, the highest of all geographic areas tracked and closed sales increased 13%. 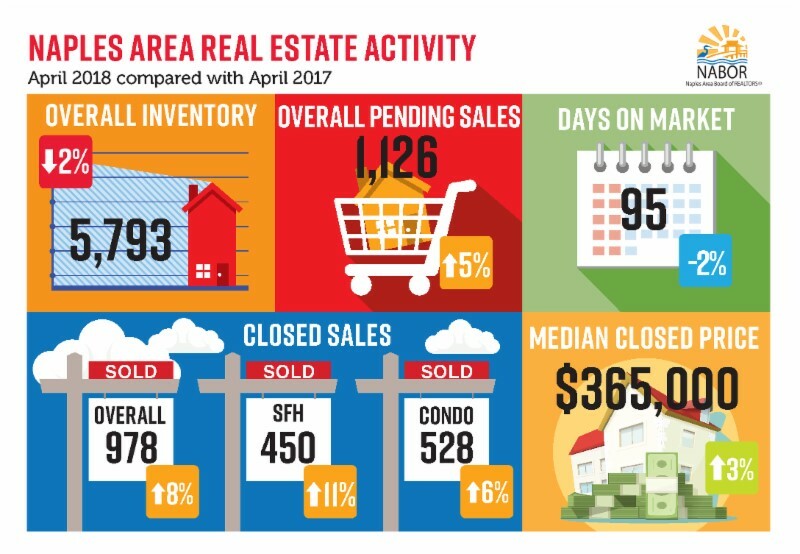 April's month over month activity was even more impressive in the North Naples area, as reflected in a 26 percent increase in closed sales. Similarly, the median closed price of condos in North Naples dropped 14 percent in April to $258,000 from $300,000 in April 2017. If you are looking to buy or sell a home in Naples, please contact me as I possess the experience and knowledge to provide an accurate market comparison, so you can determine favorable pricing options. I am here to help. Select a date in the future on which your blog will automatically be published.